Governor Nasir el-Rufai of Kaduna State on Sunday said he was extremely sad that Nigerians were passing through the worst economic downturn ever witnessed in the history of the nation. El-Rufai, who spoke in Lagos during the Sunday service of The Latter Rain Assembly, noted that there was no denying the fact that Nigerians were contending with multi-facetted challenges, which were the outcome of the looting of the nation’s resources in the past years. He, however, believed that the citizens needed to cooperate among themselves and with the President Muhammadu Buhari-led government to see the nation through its trying times. The governor added, “We have always known that there is massive corruption in Nigeria but the revelations of the past one year have shocked even the most pessimistic of critics. Nearly 70 per cent of Nigeria’s oil revenues disappeared without a trace. “Of course, there must be consequences for that. When we sit down with President Buhari these days, I pity him. I pity him because he has always become President anytime Nigeria is in trouble. “First, it was after the NPN (National Party of Nigeria) government had almost grounded the economy (in 1984) and now, after a massive looting of the nation’s treasury; and he has to lead the team to fix it. El-Rufai argued that Buhari’s strength was also his weakness, explaining that trusting people was a virtue, saying it could become a weakness when one could not come to the reality that only a few people could be trusted. “President Buhari loves humanity passionately; his strength is that he believes everyone could be trusted, which is also a weakness. When he gives people any assignment, he expects people to carry out the assignment with all honesty. Unfortunately, this is not so all the time as we have seen over time and that’s why I said it is a weakness. “The President is not a man who has interest in making money for himself or for his friends. Mistakes could be made; only God is perfect,” he added. El-Rufai attributed his status today as a governor to the advice of the Serving Overseer of The Latter Rain Assembly, Pastor Tunde Bakare, who, he said, invited him to “Buhari’s party,” the CPC (Congress for Progressives Change) in 2011. He stated, “I already made up my mind never to go into public office after I left office the last time. Pastor Bakare told me that I should not be bitter; that I should forgive anyone who might have offended me and should move on with my life. “He then invited me to the join Buhari’s party, the CPC, in 2011 and we have continued since then. Today, I’m close to President Buhari because of what Pastor Bakare has done. Today, I’m a governor because of what Pastor Bakare has done. I’m no longer sad; I’ve forgiven everyone; and I’m no longer bitter. El-Rufai, a former Minister of Federal Capital Territory, said Nigerians belonged to “one nation under one God,” adding that there should not be any reason to discriminate based on religion. 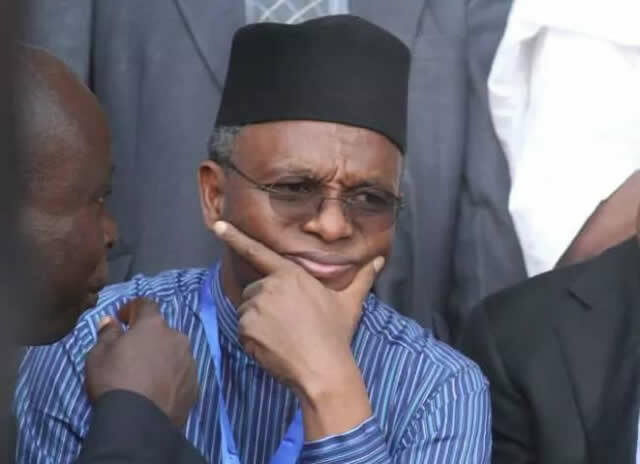 Hey Buddy!, I found this information for you: "El-Rufai…. Nigerians’ Current Travails Sadden Me". Here is the website link: https://360kwado.com/el-rufai-nigerians-current-travails/. Thank you.